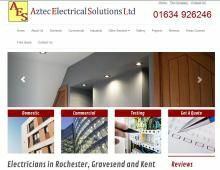 Located in Kent, Aztec Electrical Solutions Limited have a team of experienced electricians in Gravesend & Rochester. They provide both commercial and domestic electrician services throughout Kent and have an enviable reputation for outstanding workmanship. The electrical contractors in Rochester have been providing their professional electrical services in Kent for over 15 years and are a highly recommended local electrician in Rochester. They undertake all electrical works from CCTV installation and the installation of security alarms to fitting interior lighting and replacing consumer units. Whether you are looking for commercial electricians in Rochester, industrial electrical contractors in Kent, or a domestic electrician in Gravesend – contact Aztec Electrical Solutions Limited to find out more information on their extensive range of electrical services in Rochester.